Large prairie dog. Pinkish brown above; whitish or buffy white below. Slim, sparsely haired tail with black tip unique among prairie dogs. Short, rounded ears; large black eyes. Length: 1416.38 in (35.541.5 cm); tail: 2.94.5 in (7.211.5 cm). Weight: 3248 oz (9071, 361 g). Eastern Montana and southwestern North Dakota south to extreme southeastern Arizona, New Mexico, and northwestern Texas. "Discovered a Village of Small animals that burrow in the grown (those animals are Called by the french Petite Chien) Killed one and Caught one a live by poreing a great quantity of Water in his hole we attempted to dig to the beds of one of those animals, after digging 6 feet [1.8 meters], found by running a pole down that we were not half way to his Lodge... The Village of those animals Covd. about 4 acres [1.6 hectares] of Ground on a gradual decent of a hill and Contains great numbers of holes on the top of which those little animals Set erect, make a Whistleing noise and whin allarmed Step into their hole. we pord into one of those holes 5 barrels of Water without filling it. Those Animals are about the Size of a Small Squ[ir]rel... except the ears which is Shorter, his tail like a ground squirel which they shake & whistle when allarmd. the toe nails long, they have fine fur." 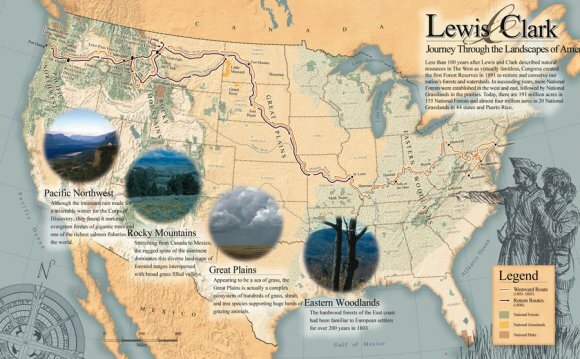 National Geographic Guide to the Lewis Clark Trail is a book on the Lewis and Clark Expedition, written by Thomas Schmidt.